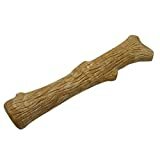 Petstages combines real wood with durable strength, creating a stronger, safer stick for medium breed dogs. This entry was posted in Small Animals and tagged Durable, Medium, Petstages, Stick by One Boutique. Bookmark the permalink.